In the past I’ve been pretty indifferent to pasta salads. I never feel like they really deliver on flavor. I’ve been lucky in the past couple months to try two outstanding pasta salads. First there was the Whole Wheat Pasta Salad with Zucchini and Olives and last night my mother in law served this Orzo Salad as part of our joint birthday/Father’s Day celebration. (My birthday was last Wednesday and Brandon’s is this Tuesday.) I went back for seconds and took leftovers home for lunch. 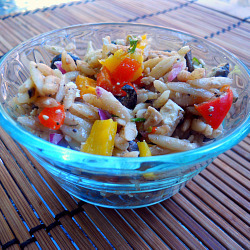 It is so full of flavor and I think it’s a very pretty and colorful pasta salad. The ingredient list is a little long but the preparation is simple. I think it would be easy to cut down on the ingredients. Although pretty, I don’t think it’s necessary to use three different colors of peppers and I also think you could get away with using one variety of olives instead of two. But I do recommend the recipe as is. I’m definitely keeping this one in my summer side dish lineup. 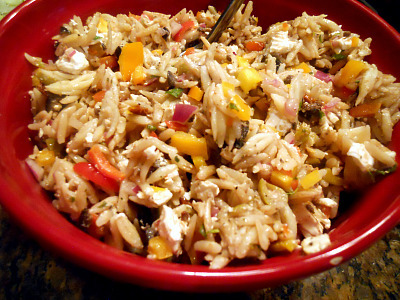 Cook orzo according to package directions and drain. Combine all ingredients in a large bowl and mix well. Chill before serving. Yum! 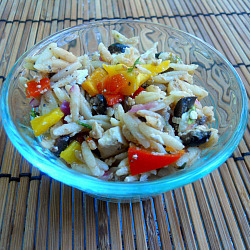 I love Orzo – I think the secret is making a vinegarette/dressing to toss it with like this one. Looks great! Orzo pasta is my fave! I can’t wait to try this recipe, Jen! This looks so good! It looks like a simple dish for a vegetarian who can’t cook (aka: me). I’m definitely going to give it a try!